The Tea Rose Stakes is a Group 2 race for three-year-old fillies held at Royal Randwick Racecourse in September on George Main Stakes Day during the Sydney Spring Racing Carnival. The day’s racing is headlined by the Group 1 George Main Stakes (1600m), which is supported by two Group 2 events: The Shorts (1100m) for the spring sprint stars and the Tea Rose Stakes. Part of the Princess’ Series of races, the Tea Rose Stakes is contested over 1400m at set weights plus penalties and offers a total of $200,000 in total prize money. It is a traditional lead-up to the Group 1 Flight Stakes (1600m) at Randwick in October and recent fillies to complete the double include First Seal (2014), Guleph (2013), Streama (2011), More Joyous (2009) and Samantha Miss (2008). The latest edition of the Tea Rose Stakes runs on September 15, 2018. Tea Rose Stakes odds are led by the in-form fillies of the spring coming off good lead-up runs in Sydney races against similar company. Upsets are not uncommon and notable recent double-figure hopes in Tea Rose Stakes betting to salute include Alizee ($10 in 2017), Pearls ($12 in 2015), First Seal ($15 in 2014) and Longport ($26 in 2012). The season’s best Tea Rose Stakes 2018 betting odds and links to our markets will be made available to punters right here the week of the race so stay tuned for the top Group 2 Randwick racing markets. The Tea Rose Stakes field attracts the season’s best middle-distance fillies heading towards a run in the Flight Stakes over a mile back at the track a fortnight later. The fillies that line-up in the Tea Rose Stakes field each spring can come off a number of earlier fillies’ only races including the Group 2 Silver Shadow Stakes (1200m) the month before, which Kimberly Star ran second in before her third in the 2015 Tea Rose Stakes two runs later. The other popular lead-up run that is also part of the Princess’ Series for 3YO fillies is the Group 2 Furious Stakes (1200m). In 2014 the Furious Stakes winner Winx went on to run second in both the Tea Rose Stakes and Flight Stakes. She would later win a host of Group 1s including the 2015 and 2016 Cox Plate. That same year Blue Diamond winner and Golden Slipper runner-up Earthquake ran third in both the Furious Stakes and Tea Rose Stakes. First Seal (2014) took out the Tea Rose Stakes – Flight Stakes double during her three-year-old season. Photo Credit: Steve Hart. 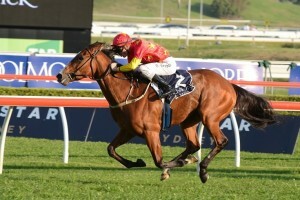 The Furious Stakes also produced the 2013 Tea Rose – Flight Stakes winner Guelph (2nd). That year the Furious Stakes winner Bound For Earth went on to run third in both the Tea Rose Stakes and Flight Stakes. In 2017 Alizee came off a Silver Shadow (2nd) and Furious Stakes (4th) lead-up to score the upset at double-figures. Tea Rose Stakes graduates traditionally back-up in the Flight Stakes. In 2015 Honesta ran second in both races and later went on to cross second twice more in Melbourne including in the Group 1 Crown Oaks (2500m) at Flemington. The Tea Rose Stakes – Flight Stakes double has been achieved many times in the past decade, most recently by First Seal (2014). She also went on to cross second in that year’s Group 1 Spring Champion Stakes (2000m). Plenty of Tea Rose Stakes winners also go on to place in the Flight Stakes trifecta including in 2012 when Longport backed up for a second in the Group 1 behind Norzita who improved on her second in the Tea Rose. The official Tea Rose Stakes 2018 final field and barrier draw will be available below once announced on the Wednesday of George Main Stakes Day. The 2018 Tea Rose Stakes Nominations closed on Monday September 10 and featured the likes of Tony MvEvoy’s Oohood and John O’Shea’s Pretty In Pink. The Tea Rose Stakes form guide features all the crucial information for punters like the jockeys, trainers, barriers and lead-up runs. The best form line to follow into the Tea Rose Stakes is that out of the earlier Princess Series legs including the Furious Stakes. Tea Rose Stakes form has held up more often than not in the Flight Stakes the following month as well as Melbourne Spring Racing Carnival Group 1s later in the season. Good Tea Rose Stakes tips include looking for fillies coming off a top three run in Sydney last time out, proven Randwick performers and those suited to at least 1400m. The favourites only have a fair recent record in the race so laying the top fancy is another popular Tea Rose Stakes betting tip during the spring. Our Ladbrokes’ insider Tea Rose Stakes 2018 betting tips and exotic selections will be detailed below leading up to the race so stay tuned for the fillies to get behind in the George Main Stakes Day support act this September. The Tea Rose Stakes results have been a mix between short-priced favourites and double-figure roughies in the past decade. Tea Rose Stakes winners of late include Pearls (2015), First Seal (2014), Guelph (2013), Streama (2011), More Joyous (2009), Samantha Miss (2008) and Sunline (1998). The official Tea Rose Stakes 2018 race results and full finishing order will be available below once the Group 2 Randwick race is run on September 15, 2018.